Geoff Cauble raised a total of $32,250 during the 2018 special election. Many of his donors are fellow Republican campaigns (Richard M Jeffares Campaign Committee: $2,600; David W Knight for State House: $2,500). His corporate donors include Publix, Waffle House and UPS. Cauble’s top Democratic rival, El-Mahdi Holly, raised a total of $8,025 from individual donors. 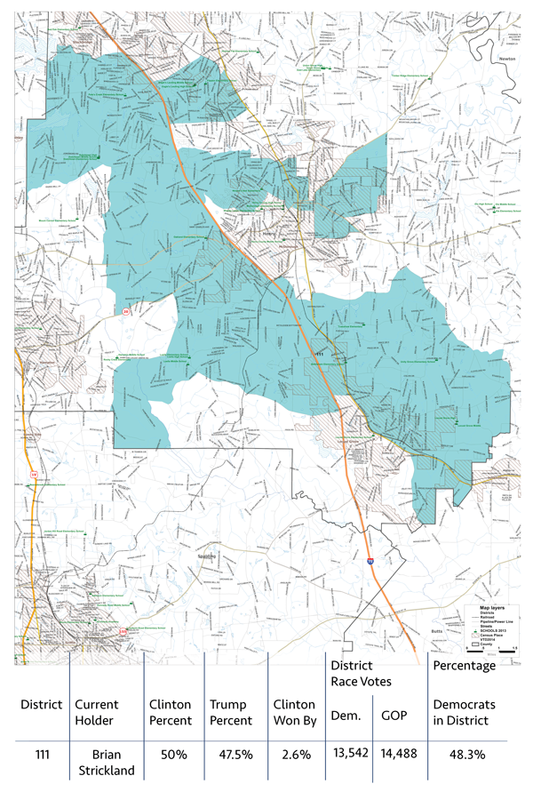 Republicans have repeatedly tried to gerrymander District 111. In 2015, new boundaries cut the total number of registered voters by approximately 3,000, of whom more than 2,500 were people of color in a district that is majority-minority. The new map was an attempt to make the district about 4 percent more Republican, but Clinton won by a margin of 2.6 percent. In 2017, a tabled reapportionment attempt [HB 515] included changing the 111th. It called for gerrymandering to bring in 1,200 new white voters and remove about 1,500 black voters. The plan failed due to citizen action and threats of a lawsuit. Geoff Cauble (R) is a general contractor and head of the Henry County Development Authority. He ran on issues of transportation, education and economic growth. During the 2018 special election, Georgia Republicans sent out a mailer with racist undertones against the Democratic candidates during the 2018 special election. El-Mahdi Holly (D) is an educator and a community organizer and has played key roles in several political campaigns. He has been deeply involved with Georgia’s Democratic party and has a long list of endorsements, including Stacey Abrams. In the special election, turnout was only 3,652 voters. Voter turnout will be key in flipping this district.